As we have discovered previously, everyday life can be very different, depending on your choice of location within the Axarquía. Let’s assume there are broadly three main area choices – the coastal zone (la costa), the inland villages (los pueblos) and the open countryside (known locally as “el campo”), giving plenty of opportunity to choose the landscape that best suits your needs. Each area has its devotees and all offer advantages. In this series of articles entitled “Coast, Villages or Countryside” we are exploring each in turn, to give you a flavour of what you can realistically expect in the various landscapes. We have looked at the coastal areas and the inland villages, so now we will consider what holidays, or more permanent life, is like in the countryside. The only way to refer to the open countryside around here is “el campo”, which will be understood by all Spaniards and most foreign residents. Throughout the Axarquía region, to the east of the city of Málaga, there is almost no flat land (other than near the coast), so the countryside will be either hilly or mountainous. Most people live on the slopes of hills and valleys which run eventually to the sea. This means that from lots of places you can find country houses and villas offering stunning views down the valleys to the Mediterranean Sea in one direction, and back inland towards lofty mountain peaks in the other. The altitude above sea level will have an effect on average temperature and the kind of plants that can be grown in gardens. Anything up to 500 or 600 metres above sea level still gives Mediterranean weather all year round, and a whole range of citrus trees and avocados can be grown, together with the typical long-established crops of olives, grapes and almond trees. Indeed, these latter three crops can be grown at higher altitudes in areas with quite cold winter weather, as it is very high summer temperatures that is needed for successful fruiting. Many country houses come with substantial land attached, often ranging from 2,500 square metres to 10,000 square metres or more. This gives plenty of opportunity for growing your own vegetables, or a range of fruit trees and plants, which cannot easily be grown in more northern climates. The available land area means that most campo houses have plenty of parking space as well as their own private swimming pool, which you would not have in a village house, or would likely have to share in a coastal apartment or development. You might also find that house prices are generally a bit lower than on the coast, but this is not always the case. Country houses might be the traditional cortijo or finca, or a more modern house often referred to as a villa. If you are considering buying a holiday home in the countryside, you might need to think about getting someone to look after your land and pool in your absence. 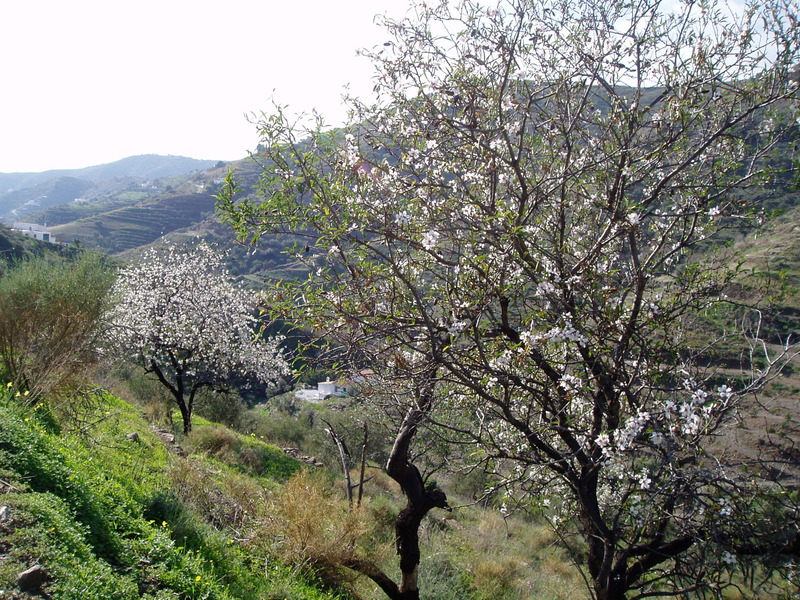 Much of the countryside in the Axarquía region is terraced, and apart from the grapes, almonds and olives you will increasingly see avocados and mangoes being grown, due to the sub-tropical climate. In January and February, the pink almond blossom is spectacular and, as the year progresses, the wildflowers are pretty special too. 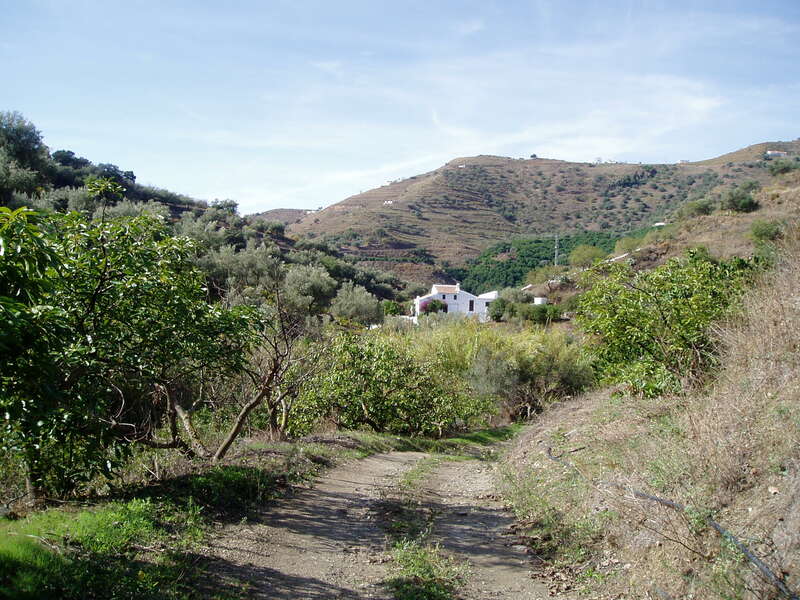 The countryside around the Axarquía is largely unspoiled with large areas of protected natural park land. You will see age-old traditions such as grapes being hand-picked, and men with long sticks whacking the olive trees for their fruit. There is no mechanisation here due to the terrain, so you can still see bullocks ploughing the fields, and mules carrying their loads. As far as services go, there are no postal deliveries in the campo, so we have a post box at the Post Office in the village, as well as having to take all of our rubbish to the waste disposal and recycling bins. There are no landline telephones because of the mountainous landscape, but don’t worry, mobile phones, satellite TV and wifi internet are available. I’ve mentioned in my Cost of Living in Spain reports that we don’t have piped gas in this area, but bottles of butane and propane gas can be easily and cheaply purchased from a variety of outlets. Living in the countryside means that you will enjoy a virtually noise-free existence except for maybe the distant bleating of goats, which are kept in pens around the hills, and can be heard over several kilometres. True peace and quiet are the norm here, as are the usually clear skies which, at night, give spectacular views of more stars than you ever thought possible. 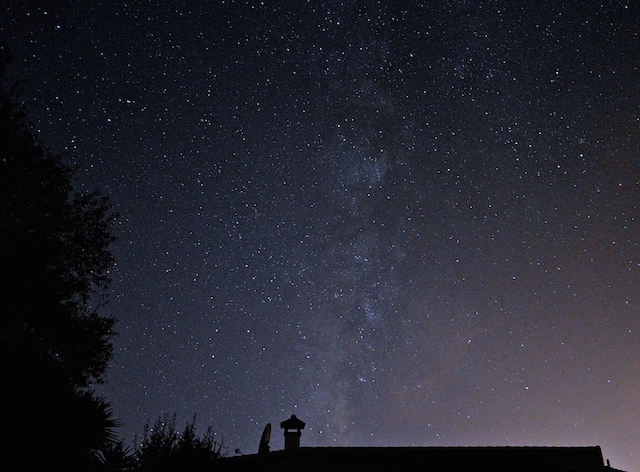 If you have not been used to seeing the stars, satellites tracking across the skies, or the Milky Way without light pollution, then you are in for a real treat. As you travel away from the coast and into the campo you will notice that there are dozens of white houses scattered about the hillsides, each far enough away from the neighbours to maintain peace but near enough, usually, to be able to keep in contact as much as you wish to. In our experience there seems to be an understanding between neighbouring households that in the event that help is needed, for example if you suffer vehicle trouble, there is a reciprocal offer of assistance always available. At first sight you might wonder how all these houses are reached but closer inspection shows that tracks have been cut across the landscape. It has to be said that these tracks vary in quality, some being well surfaced in tarmac or concrete, some being compacted stony earth but still easy to drive on, and others which are quite rough – and for these, you would probably need a 4-wheel drive vehicle. It will be obvious that should you choose one of these country houses, you will need access to a vehicle because to reach the necessities of life always involves a drive, but that usually gives an opportunity to have a look at a different landscape, visit a favourite tapas bar and drop off your rubbish or collect your post whilst you are out. We have chosen to live in the countryside for the past ten years, and have discovered that the simple joy of looking after a sub-tropical garden, picking fresh lemons, limes and oranges, together with the fabulous birds and insects we see is enough to convince us that, for the time being at least, we have made the best choice for us. We can, and frequently do, travel the few kilometres to the closest villages or the coast to have a change of outlook, but how we love to return to the tranquillity that the Axarquían countryside offers. 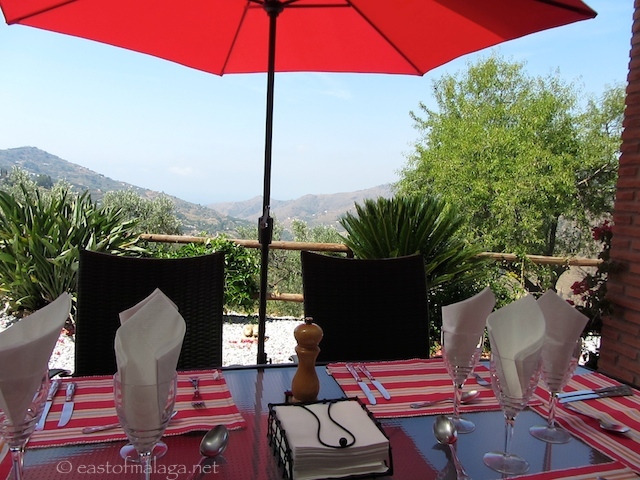 How evocative does a beautiful summer afternoon sound, spent with friends having lunch on your terrace, with many kilometres of open land in front of you and the ever-sparkling Mediterranean Sea at the bottom of what seems like your very own valley? Of course, countryside implies wildlife, and you will likely see kestrels, hoopoes, buzzards, bee-eaters as well as foxes, various lizards and praying mantis amongst many other strange creatures you might never even identify. As we are driving to the village or down to the coast along the winding mountain roads, we regularly come across herds of goats, moving from one pasture to another. Many expats who live here permanently will tell you about stray dogs turning up on their doorsteps. 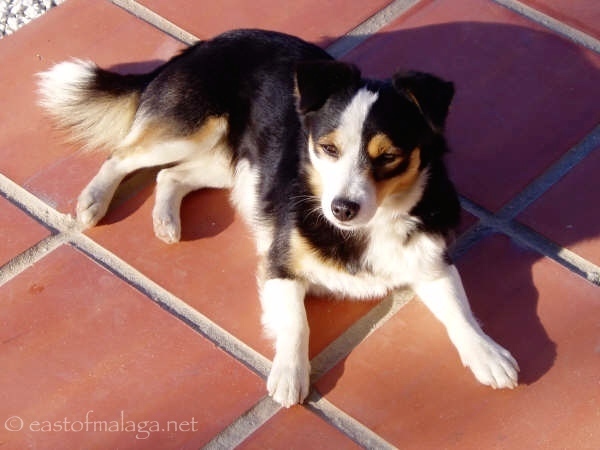 We hadn’t been here long when our little “campo dog” appeared, ready to adopt us! But, what joy and love he brought with him. So, there you have it – the choice is yours – coast, villages or countryside. Best of all, come to this little patch of paradise, east of Málaga, away from the high-rise developments and spend some time in all the locations on offer. Why limit yourself to just one type of landscape when there is so much to offer? If you were tempted to come back for longer or even to come and live here permanently, my suggestion would be to rent a place first for a few months and get around to see as much as possible. Once you have spent sunny, warm autumn and winter days when you know that in northern Europe there is wind, rain and damp greyness, you will know just how fortunate we are to be living in such a special place as La Axarquía. Which would be YOUR choice: Coast, Villages or Countryside? This entry was tagged Andalucía, East of Malaga, Europe, garden, gardening, life, lifestyle, Malaga, photography, Spain, travel. Bookmark the permalink. I love to read your posts and learn more about this particular area. What fun to see your “campo dog”. He definitely looks like a keeper! (And I’m still basking in the pleasure of finally sitting down with you in person last month!) I referred a reader to your blog as she was planning a trip down your way. I hope you heard from her. Cheers to you and Michael. Absolutely truy Marianne ! Very accurately written ! We have bought a house last year with an astonishing view on the La Viñuela lake : what a view ! and what a silence !!! At night you can hear the bells of the goats in the mountains and some time later the whole group filling your street on their way to their stable… lovely. I LOVE the goats, Geert. Glad you’re happy with your house purchase. What a stunning region, I really must visit! Well, one of my neighbours has a house near-ish Malaga, so who knows! Lovely countryside. We live on the Costa Blanca, near the beach, but overlooking el campa so we have the best of both worlds. It´s nice and quiet here too and we have breakfast on the terrace listening to the many birds in the trees across from us. Heaven!! Love your articles. 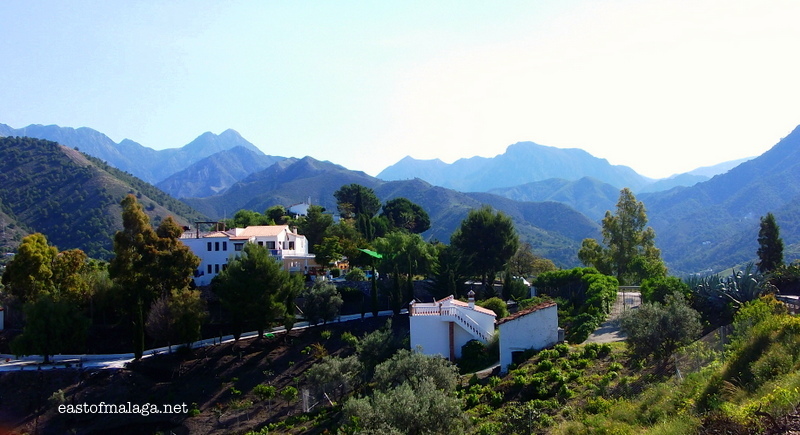 … we live in Frigiliana in the edge of the village but not quite in the campo . … we can view it and the coast from our house …. lunch myself each morning when viewing the campo and mountains from the kitchen sink !!! !